An FN-Five Seven pistol similar to that used by Nidal Hasan in the 2009 Fort Hood shooting. Image via Wikimedia Commons/user: Bobbfwed. (CCA-By-3.0). While leaving the door open for refiling and further claims, a U.S. judge dismissed service members’ demands for recompense in the 2009 Fort Hood shootings. A Washington, D.C.-based judge has dismissed a wrongful death suit brought against senior government officials and civil employees accused of negligence in the 2009 mass shooting at Fort Hood military base. The shooting, notes Reuters, left 13 dead and at least 30 others wounded. In a Tuesday ruling, U.S. District Judge Colleen Kollar-Kotelly said she lacked jurisdiction in the claims brought by more than 150 victims and family members. Named in the suit were the secretaries of defense and army as well as the former chief of the Federal Bureau of Investigation. Kollar-Kotelly said the case wasn’t suitable for her courtroom because it didn’t name the United States as a defendant too. Reuters reports that another cause for dismissal was that the plaintiffs hadn’t exhausted all possible remedies with the Army and FBI. In other areas, Kollar-Kotelly said the government has limited liability in instances of civilian misconduct. The damages lawsuit was filed three years after the November 2009 attack, when U.S.-born Army major and psychiatrist Nidal Hasan opened fire in a Fort Hood medical facility. Hasan, apparently inspired and radicalized by Islamist fundamentalists, yelled “allahu akbar” as he rampaged through the hospital. Captured alive, Hasan was sentenced to death in a 2013 court martial. 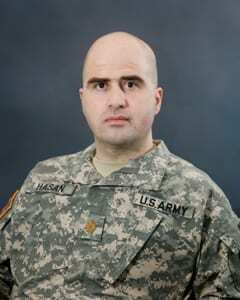 Convicted Fort Hood shooter and former U.S. Army major and psychiatrist Nidal Hasan was sentenced to death in 2013. Image via Wikimedia Commons/U.S. Army. Public domain. The lawsuit claims that the government and Hasan’s superiors should have known the physician was a threat. He allegedly mistreated American soldiers entrusted to his care, signaling danger that could’ve been averted. The Army Times recounts how the suit challenged Hasan’s position within the military and claimed he was given special privileges on account of his skin color and religion. “This attack occurred only because Defendants afforded the terrorist Hasan preferential treatment due to his Muslim religion and Arab ethnicity, preferences rooted in policies of ‘political correctness,’” the suit claimed. In 2016, attorney Reed Rubinstein, representing the plaintiffs, alluded to similar instances. He seems to suggest that radical Islamist attacks like Hasan are frequently foreshadowed and rarely prevented, despite clear warning signs. The Army Times and Rubinstein both predicted that the government would file to dismiss the suit. Under Supreme Court precedent outlined in the Feres Doctrine, severe liability limits are enforced upon members of the armed serve in lawsuit against the government. Kollar-Kotelly did provide the potential for legal recourse, saying some claims could be refiled. However, she said military personnel and their families cannot recoup damages because their injuries were “incident to military service,” limiting government liability. Reuters quotes attorney Neal Sher, working for the plaintiffs, as questioning the ruling’s merit. “We will take whatever steps we can to pursue our claims,” Sher said, indicating that he’s begun a comprehensive review of Kollar-Kotelly’s 46-page ruling. Hasan, notes Reuters, is believed to have been radicalized, at least in part, over the internet. He traded communications with Anwar al-Awlaki, a Yemeni-American suspected of being a chief figure in al-Qaeda. Al-Awlaki was killed in a drone strike in Yemen in 2011.